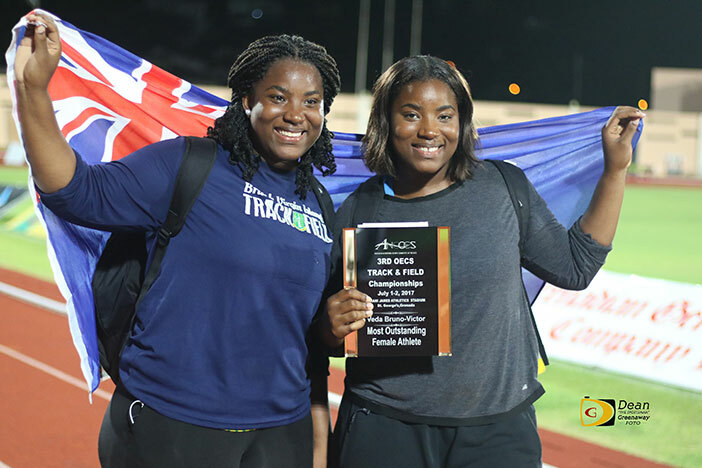 During competitions in Ohio, Iowa and Virginia over the weekend, five BVI athletes were victorious—three in field events and two in track—and another two finished in the runners up positing. Findlay University Seniors and twin sisters Tynelle and Trevia Gumbs—a-competing unattached—won the Weight Throw and shot Put events at the Findlay Classic and Elite Throws competition on Saturday, in their season debut. Tynelle the defending NCAA Division II Weight Throw champion, uncorked her 2018 season following meet cancellations because of bad weather and no throws in another, with a winning throw of 20.93m (68’8”). The mark also qualified her for the Great Lakes Athletics Conference Championships, scheduled for Hillsdale, Michigan, February 23-24 and the NCAA Division II Championships, March 9-10 in Pittsburg, Kansas. Trevia was fifth with a personal best heave of 19.70m (64’7½”) also a GLACC qualifier and a provisional NCAA Division II mark. Trevia then used another personal best of 14.79m (48’6¼”) to win the Women’s Open Shot Put. At the Iowa Hawkeyes Black and Gold Premier Invitational, Barton County College freshman Adriano Gumbs, won his debut 600m with a time of 1 minute 22.30 seconds. At the same competition, Iowa Central College freshman Akeem Bradshaw, broke the meet record to win the Triple Jump. After fouling his first attempt, the BVI athlete had a leap of 14.68m (48 feet 2 inches) on his third try, to take down the year-old record. Sophomore teammate Nelda Huggins, finished second in the Women’s 60m dash by lowering her season’s best from 7.49 seconds to 7.40. She won her heat in 7.46. She was third overall in the 200m with a time of 24.93 seconds, after placing second in her heat. Khari Herbert made his 2018 debut by winning the Finn Pincus Invitational 400m in Roanoke, Virginin. Herbert stopped the clock at 48.46 seconds. Competing in the Indiana Relays, Rikkoi Brathwaite was second in the 60m dash in 6.87 seconds. The BVI native ran the same time for second in his heat and advanced to the final. Elsewhere, Shaquoy Stephens made his season debut with a fifth place finish in the 60m dash at the Pittsburg State Invitational in Kansas. He was timed in 6.80 seconds. Competing for Elite Track Club in Houston, Tex., Josh Hill had a 400m career best of 49.03 seconds to place eight overall. Veteran sprinter Tahesia Harrigan-Scott, lowered her season’s best from 7.43 seconds to 7.39 in the KMS Indoor Invitational in Birmingham, Alabama, after a second place finish. She turned in a time of 7.51 in the semis, where she was also second. The veteran has run under 7.40 seconds in 13 of the last 15 seasons.